A large number of our products come with our “Two Week, Try it Free Guarantee” and a Life Time Warranty. Once you receive your holster you have two weeks to try it out. If for any reason you are not completely satisfied simply return it and we will refund the purchase price of the holster. Shipping charges are not refunded. If the holster should ever fail under normal use, we will repair or replace it as long as you own it. Please be aware that previous custom work cannot be replaced when performing a repair. When sending in a repair or return please note that it will take 2 to 4 days to enter it into the system. Once entered into our system you will be notified by email letting you know the process has begun (refunds will not be notified until the refund is completed or more information is needed). The return or exchange then will take an additional 3 to 7 days to process through production to repair or replace your item.We then will send you an email with the tracking information once the item has shipped. CrossBreed® Holsters prides ourselves in making the best holsters and accessories in the industry and if for any reason you are not satisfied please call or email customer service and we will strive to exceed your expectations. 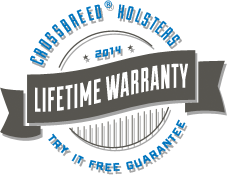 For CrossBreed® Holsters firmly believes that our customers are the best there is and we’ll do whatever we can to make your purchasing experience the best in the industry. If you have questions regarding the the return/repair process please contact us or give us a call at the customer service department toll free at 888-732-5011.